I had the pleasure of hanging out with our middle school’s Minecraft club after school today. It was awesome the way the kids were entering each other’s worlds and building things together. One 6th grade student asked if I was going to hang out and asked to use one of my MaKey MaKey boards to build a custom controller for Minecraft. And so the design cycle began. 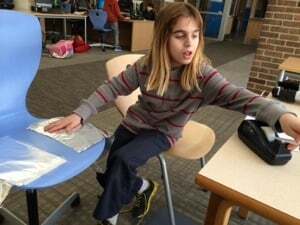 This maker already had a conceptual understanding of the control chair he was about to invent. He also knew the Minecraft interface well and how to hack the keyboard controls. He just needed the right materials. Tinfoil and MaKey MaKey. He rolled a chair over and began taping foil to either side of the seat. The idea was to control the direction that his character turns by leaning either left or right in his chair. 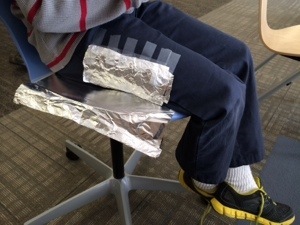 He understood that their needed to be a closed circuit so he also taped tinfoil to his pants to trigger the left and right controls when he leaned either way. The other control that the maker wanted was to walk forward. Thinking about how his controller worked, he decided to use his shoes as the trigger to move forward. 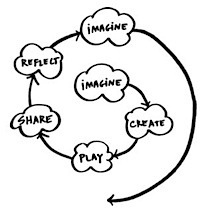 The reflection process is as important as the Imagine and Create processes. In this case, this maker needed to redesign the forward interface. 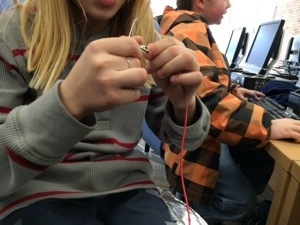 He decided to use a paper clip and tie into the MaKey MaKey’s “w” key. It is in this process where the maker mindset moves to make the design better. It is in the problems that arise that creates experiences for learners and thinkers to practice this mindset. It was so cool to watch and be a part of the thinking process. This maker has incredible ideas and a creative mind. Keep you eyes out for a custom chair controller in Kickstarter.